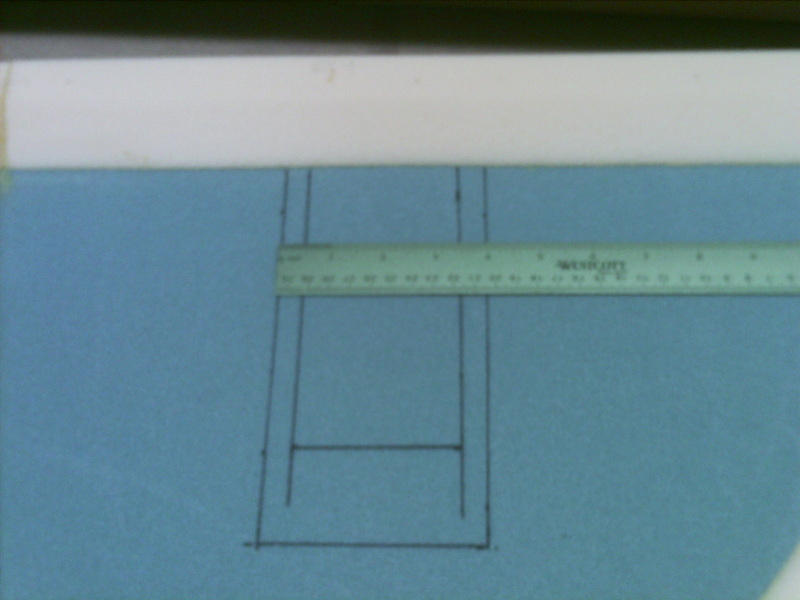 Cut out the rest of the jig pieces, and mounted to the table for laying up the longerons. Note that when cutting FJA jigs, after cutting, I clamped them together and hit them all with the belt sander to ensure they were all uniform to each other. Glued up the three strips for each side to make up the longerons. Clamped to the jigs to let cure. 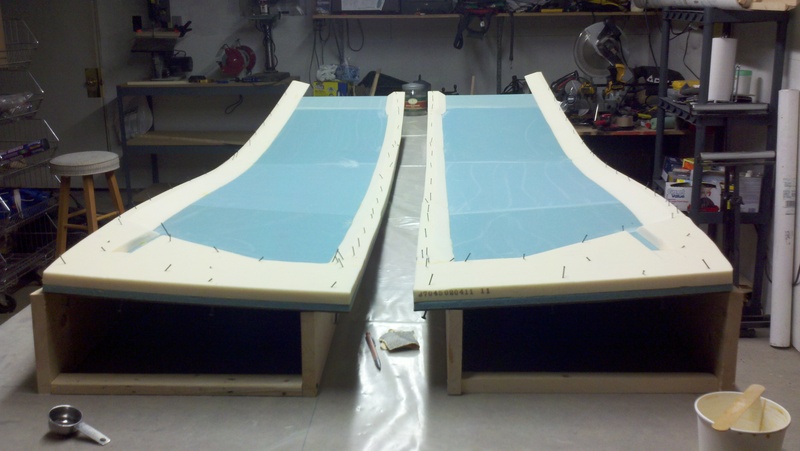 Measured and made relief cuts in both the 60″ longeron doublers. Measured the position for each of the doublers and marked a line where they mount on the longeron. Drilled the holes for the nails and made a test fit. Pulled all the nails and added wet flox to all the connecting pieces. Put them in place with the nails again, and added weight in several places to keep a nice fit till cure. (This took a while) Used left over flox to fill a few holes and some of the relief cuts. Note that i read a post on someone else’s site where they put the 5 1/2″ doubler right to the front of the longerons, instead of 5.3″ in. At first I wondered how that could happen, and then I realized while doing this step, as I almost did it myself. When I measured in 5.3″ (corrected from 5.0″), I made a line for where the 5 1.2″ doubler starts (Note that I only marked where it starts, and not where it finishes as well). When I got to drilling the holes, human nature (I suppose) had me position the doubler before the line, instead of after the line. Good catch, I suppose. Removed the nails from the longerons after cure and pulled off the jigs. Some of the flox leaked between the jigs and the longerons, and some of the wood removed as well. Will have to sand and fill as necessary. Cut out the masonite for the fuselage sides. Ended up picking up a second sheet, as the leftovers were not enough to add for the extra length. (At the suggestion of others, I am waiting to assemble the jigs till I have all my pieces cut out, so I can take advantage of the work surface) After I rough cut the masonite for both sides, I clamped the two pieces together, and ground down to shape with a belt sander. This keeps them uniform to each other. 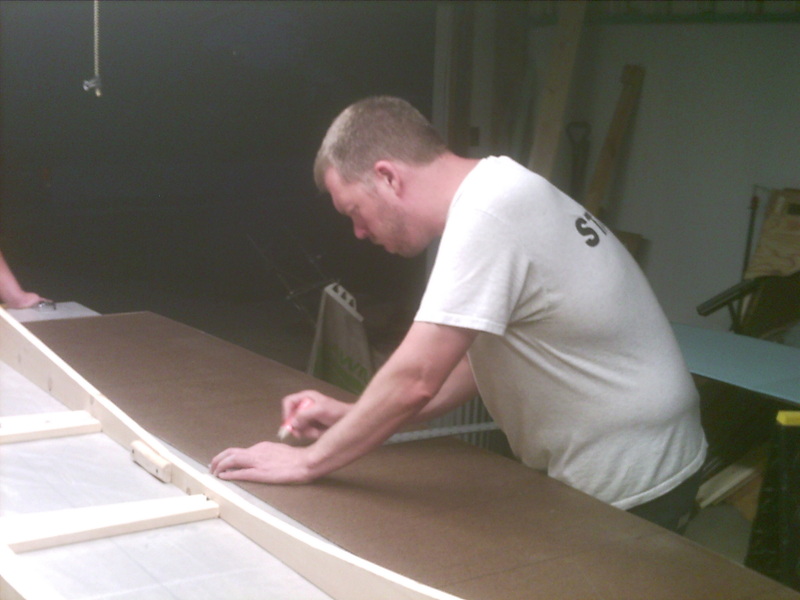 Finished out the night by edge gluing the four pieces of 3/8″ foam. Marked up the foam I edge glued the previous night, and cut to the proper dimensions. 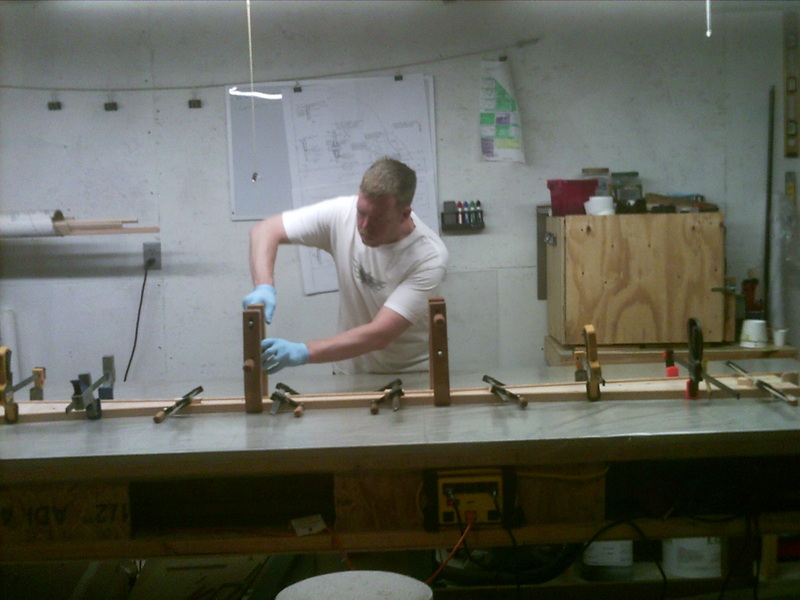 Working on assembling the jigs for the fuselage sides. Kelly and the kids got into town, so hung out with them instead. 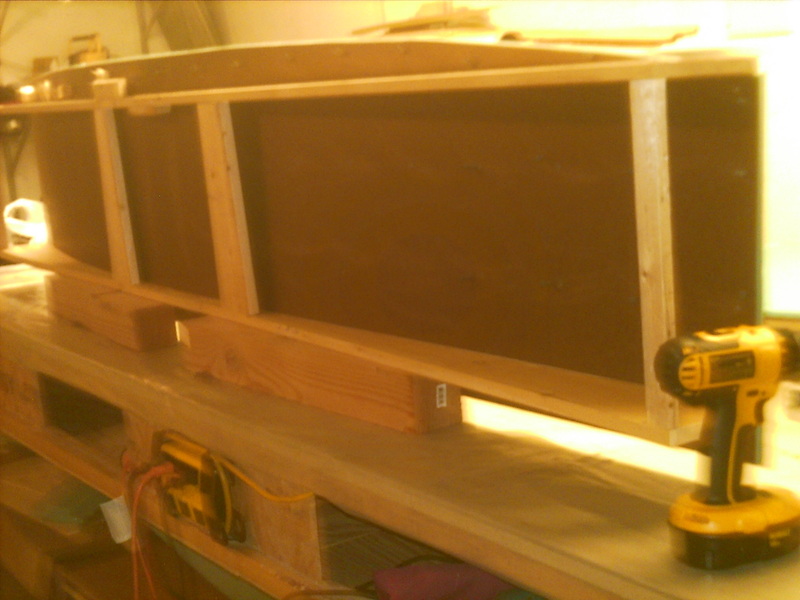 Working on finishing up the jigs for the sides. 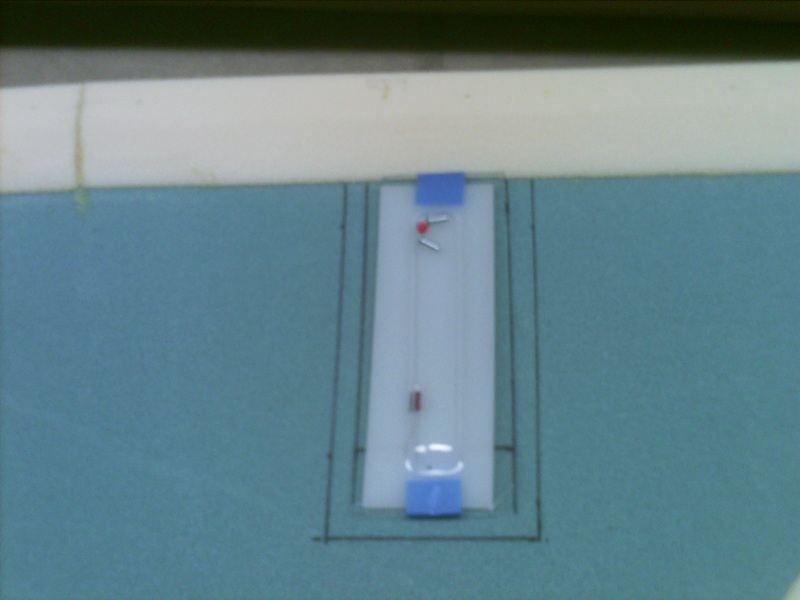 I opted to use the “screw the foam to the jigs” method over the plans “dab of 5-min epoxy” method. Seems I read that it only added a half hour to the build time. One thing I’ve noticed, is that a lot of builders must estimate the time that on thinks it “should” take to build things, as I find that when I measure the time with the clock, I find I’m 2.5 hrs into it, with two other helpers cutting spacer blocks and drilling holes in them. I will be taking all build times with a grain of salt going forward. Spacers cut and drilled, holes drilled on masonite on 6″ grid, and ready to attach the foam. 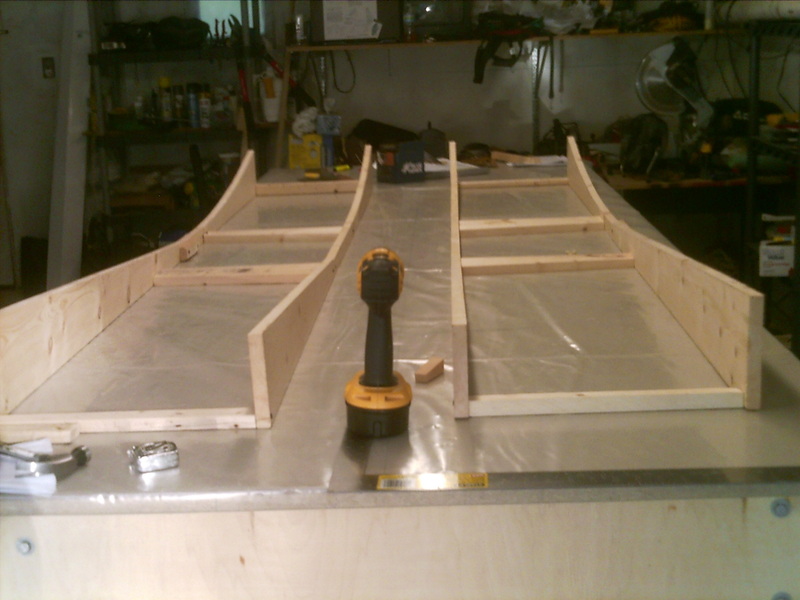 Started attaching the foam with screws using the spacers we cut out last night. This didn’t end up working that well, and I ended up holding the foam tight to the jig while screwing right through the masonite and into the foam. (No Pre-drilling) This was much faster. I started with the outside edge running lengthwise. At this point the foam is secure enough not to wander. I had a few pieces of 4×4 post left from the table build, so I used them to get the FJA, FJB, and FJC on (sideways) so I could finish securing the rest of the screws on the bottom. I had to change to laying FJA, FJD, and FJE on the 4×4 post sideways to get the last row I couldn’t reach with the drill in the previous configuration. I originally tried turning the jig upside down briefly to catch the last row, but I found that some of the brad nails came out and would not easily go back in to their privious holes. After piking through the foam, I removed them with a pliers. Then I clued the masonite to the FJ(x) pieces where the nails were removed, to save from having to remove all the screws to replace. Weighted down the jig til the glue dries. In looking at ths spacers in the next step, I think I will need to finally bread down to get the band saw. Harbor Freight during lunch tomorrow, I guess! Cut out all the foam spacers for the fuselage sides on the new band saw. Started by cutting the spacers into blocks, and then cut the angles for the transition to the H48 blue foam. Did some sanding to smooth out the transitions, and micro’d in place, securing with nails. After studying the plan and various posts about the Vance Fuel gauges during my lunch hour, I decided to go with how I deciphered it. I cut the space over size by 1/2″ on the sides and the bottom. Technically a little larger than that 4″ wide by 8″ high. 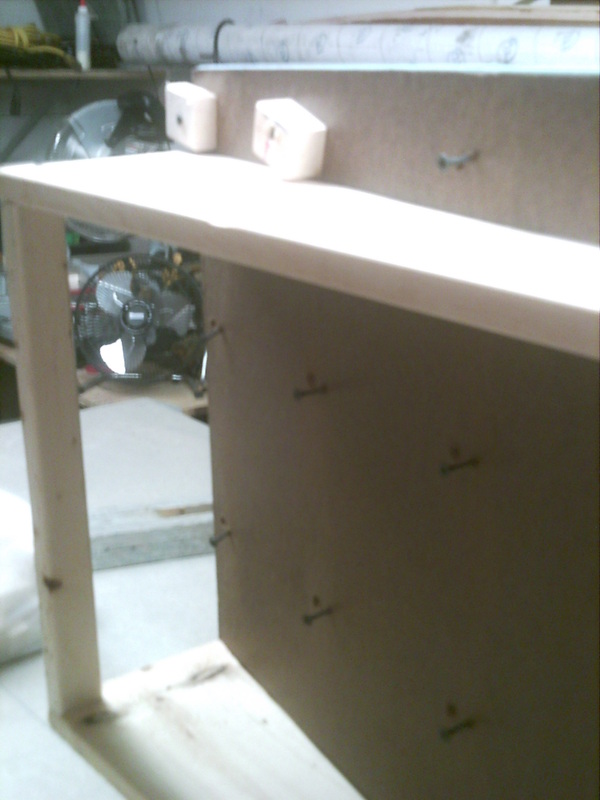 I adjusted the dimension in from the firewall to compensate for the extra half inch as well. 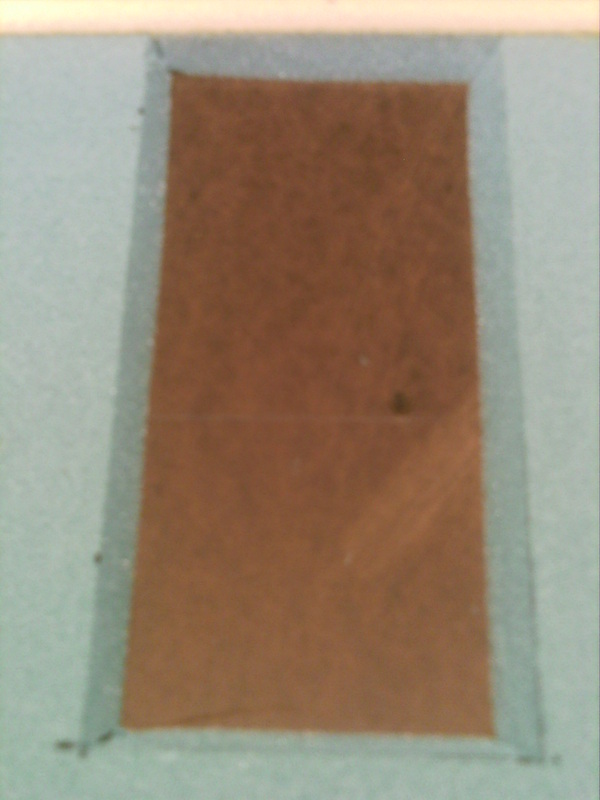 Cut them at an angle with a sharp utility knife, and sanded the corners. Failed my first attempt at the circular sanding block, and we will have to try again tomorrow. Glued 50 grit sandpaper to the wooden disc after sanding the edges to shape. Used the disc on the drill to dish out the control stick indentations. There was a bit of wobble, which made it not work out as well as I hoped. I was able to use it a little, but there was still a fair amount of hard sanding to get the desired shape. Had to remove the offending screws that protruded through while sanding.